Momma Told Me: The best tea needs no sugar. If I could relate a single item to my childhood, and Momma, it would, without hesitation, be 'tea.' No matter her stage in life, Momma has never given it up, despite caffeine wars and grumbles from pop over the pitchers in the fridge, tea is her favorite beverage. When I was younger I'd often look forward to flu season, not only would Momma baby me with all the candy and ice cream I craved, but she'd toss open those kitchen cabinet doors and allow me the full selection of her extensive tea collection. It wasn't a literal collection, of course, but there were enough varieties of flavorful little bags to have me contemplating my next attack for hours. Would I mix Perfect Peach loved pondering as I hunted for the hidden cup full of honey sticks in the back. Whether iced, or steaming hot, Bigelow tea was as much a part of my childhood memories as Spongebob Squarepants, and I'm sure to pass down those memories, and that affection, to my family today. While Bigelow is a household name in our home, there is little I knew about the company itself. As it had been around for my childhood, I knew the brand was well established, but that it's roots went 60 years back, I did not. In fact, one of my favorite blends of theirs is actually how the company got started. Founded by women, and run through familial generations, Bigelow began when Ruth Bigelow arrived at the conclusion that the American tea market was lacking zest and pizzaz. She introduced her own, sharper, more flavorful, blend of everyday tea, which quickly gained compliments leading to it's name, and 'Constant Comment' tea was born. Today this lively blend of orange and spices continues to garner compliments worldwide and remains a top seller among equally delicious blends such as Vanilla Chai and White Tea Raspberry. Bigelow remains my choice for tea due to it's simple range of classical flavors, and festive range of holiday variants, like the yummy Egg Nog blend! I love that this family run brand is driven to excellence in one category, tea, and devotes entire teams to the crafting and research of the most powerful blends, rich with natural flavors. No gimmicks, just real, good, tea. Tea is much more than a beverage to Momma, and learning to cook with tea has opened a world of flavors to my table at home. 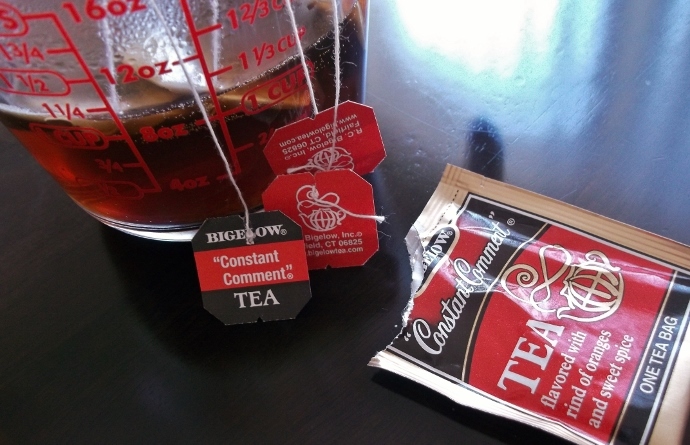 The carefully crafted blends of Bigelow tea help me add flavor without extra calories and sugars. While many might be intimidated at the thought of substituting water for tea, the truth is it can be done in nearly any recipe; the trick is pairing the right blend for your recipe. 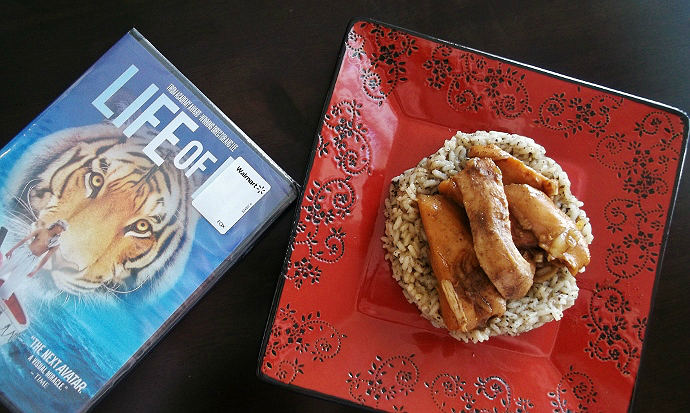 Recently we headed to our local WalMart to stock up on our favorite Bigelow favorites and pick up the Oscar Award Winning film Life of Pi on DVD. With international 'Pi Day' just around the corner (3/14), I was easily inspired that we would turn the film's viewing into an experience with exotic foods made with my favorite Bigelow blends. 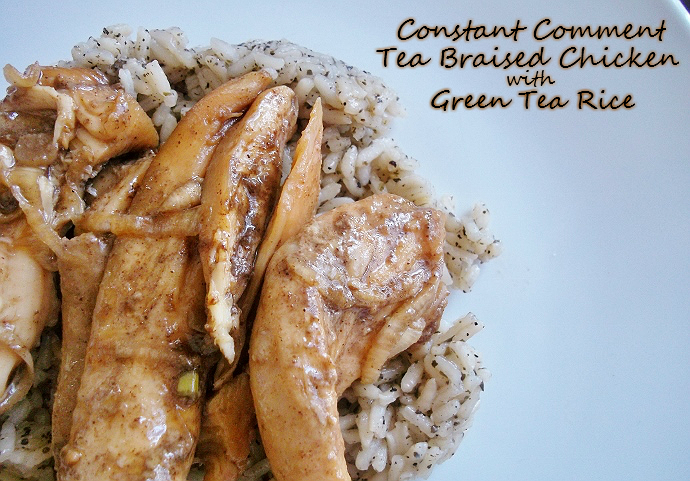 I planned a simple, yet flavorful, menu of Constant Comment Tea Braised Chicken atop Green Tea Rice with Vegan Earl Grey Poppyseed Cookies. Not to spoil the film or story in any way, but it seemed appropriate I tackle a Vegan recipe, as the majority of Pi's family is Vegetarian. 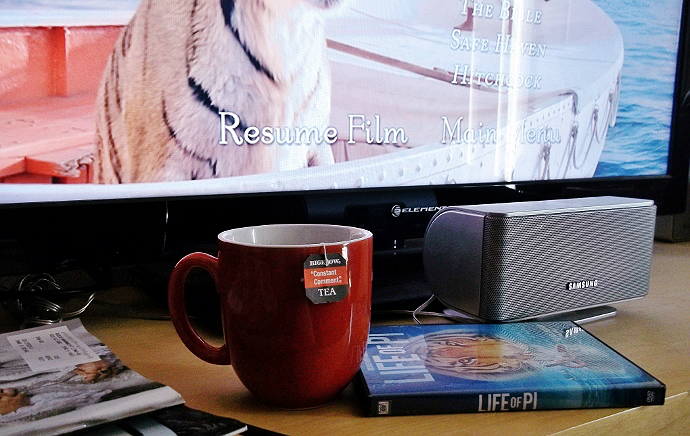 While it seems natural to me to pair my favorite tea with this film (okay, I'd drink Bigelow without an excuse too), you may need a little extra inspiration to create a tea moment of your own. 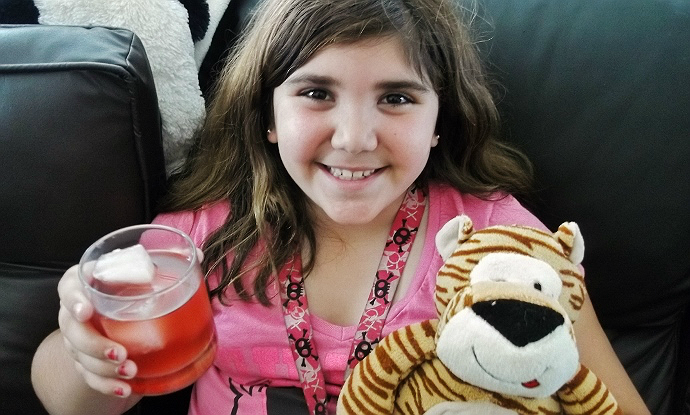 Bigelow and Life of Pi is teaming up so you can create your very own Relaxing Moments movie night, like us, with their Relaxing Moments Sweepstakes! Now through March 29, 2013, 'Like' Bigwlow on Facebook and fill out the simple entry form for your chance at one of over 175 amazing prizes, including 25 first place winners of a Panasonic Blu-Ray Player and Bigelow Chest of Teas! 1.) 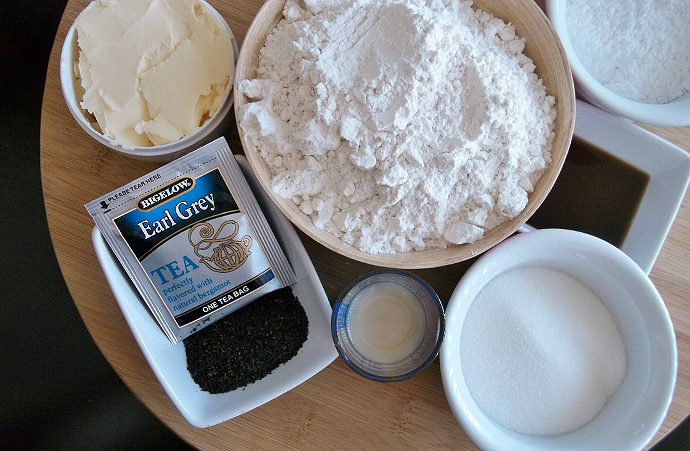 In a food processor, combine the sugars, salt, and tea. Pulse until tea is well combined and ingredients are equal size/consistency. Add flour and pulse to combine. 2.) Add margarine/butter substitute, vanilla, and soy milk. Pulse until dough begins to take shape. Remove from processor and place into large bowl. Kneed until loose bits of flour are combined and texture is even. 3.) Cut dough in half and roll into a log. Wrap the dough logs and refrigerate them for a minimum of 30 mins. Preheat the oven to 350F. 4.) Remove the dough from the fridge and cut slices that are about 1/3" thick. Place them on a greased/lined cookie sheet and bake about 12 minutes, rotating pans halfway. 1.) 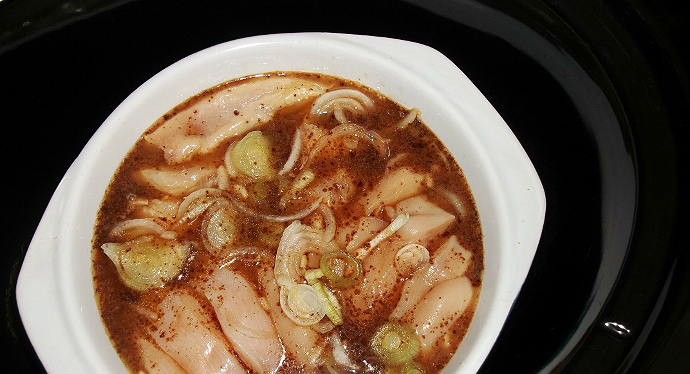 Place the chicken in a large Saute Pan or Casserole Dish. Pour the tea over the chicken and sprinkle the garlic/onions around the meat. 2.) 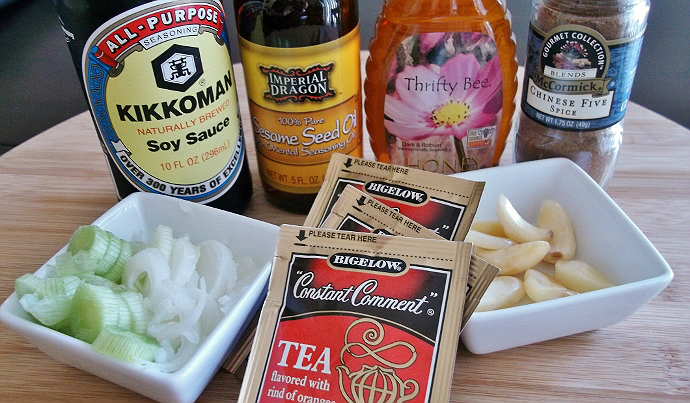 In a small bowl whisk honey, 5 Spice, soy sauce, and sesame oil. Pour the mixture over the chicken. 3.) Place the lid on the pan, or loosely wrap foil atop the casserole dish. Braise 2 hours. 4.) Remove from oven and serve atop noodles or Jasmin Rice. 1.) Boil tea, rice, and water in small saucepan. Reduce heat to low and allow to simmer for 20 minutes, or until all moisture has been dissolved. 2.) While waiting, in a separate saucepan, over low heat, stir sugar, vinegar, and salt until dissolved. Fold into cooked rice, and serve. After our delicious tea infused dinner we all snuggled up on the couch to watch the newly released Life of Pi film, munch on Zebra cakes and Earl Grey Cookies, and Sip my special blend of Bigelow Red Raspberry and Lemon Lift iced tea! Sabrina kept remarking "Is this really tea???" as she couldn't believe how flavorful it was without a drop of added sugar. When I was a child I used to cuddle on the couch with Momma and sip our favorite Bigelow blends. We'd rent all of the Oscar nominated films appropriate for my eyes and make an entire lazy afternoon out of playing critic. I'm glad tot see that Bigelow continues to inspire family traditions, and memories, still today. Life of Pi proved to be the perfect pairing for my tea infused menu, and even made Sabrina tear up towards the end, as the film's poignant tale of survival and faith hit home. I wish we'd had a chance to experience Life of Pi on the real 'big screen,' but the story still seemed quite fantastic and magical even at home. The cinematography was breathtaking, even when one considered the majority is painstakingly computer rendered, and the plot is much more than a boy and a tiger on a boat. Thematically, there are some intense moments, and a broader agenda to the plot, than merely telling an extraordinary tale. The film sparked questions about religion in general, Hinduism, and faith. I was happy to differ most of the questions to the real curiosity, for Sabrina, vegetarians, and explain Pi's struggle with survival versus his need to destroy. In the end, our Earl Grey Vegan cookies saved the day, as talk turned to how 'flavorful' vegan food can be! Bigelow, #AmericasTea, creates memories yet again! Check out an exclusive behind the scenes peek at our movie night planning and Google + album. What Daughter Says: I was raised to recognize good flavor. I was raised with Bigelow. Love me some Bigelow Green Tea! The chicken with rice cake sounds amazing. I pinned it for future reference. Their tea is amazing!! What a fantastic recipe too! I read this book and I am almost afraid to see the movie because I am not sure it could ever capture the wonder. After reading your reviews and the pairing with wonderful Bigelow tea, I think I will snuggle in with a good cup and view it! 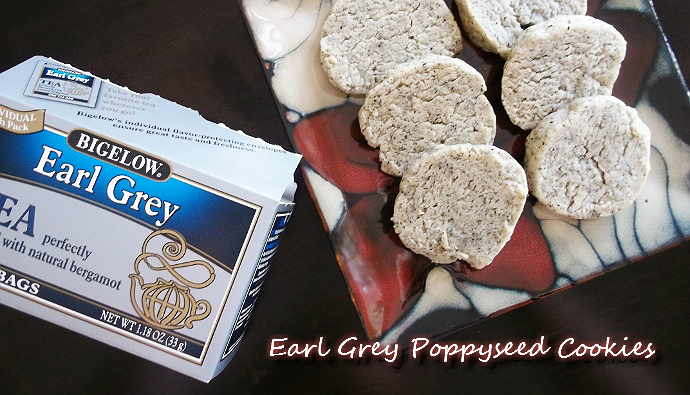 i want some earl grey poppyseed! I've got to pin this! And here is me thinking that tea was only for drinking. Oh wow. I really enjoyed looking at all of the pics. Makes me want to make the recipe and the earl grey tea cookies look very tasty! I started drinking green tea a year ago and wasn't a huge fan until I cam across Bigelow. Now, I drink at least 2 cups a day. And I'm with Shelley, I read the book a few weeks ago and am a bit afraid to see the movie. The book left me in a state of wonderment at the end! I don't want to lose that. I had really never thought about cooking with tea... until now! Thanks for the recipes. I am making my list of things to try. Wow, I never knew you could use tea for recipes! This was a great post and I learned a lot. I guess this old southern girl needs to step it up to more than overly sweet tea! I love to drink tea, but have not really explored cooking or baking with it. That recipe looks quite interesting. I drink a lot of tea...I have never thought of cooking with it tho. Great ideas and recipes too...thanks! Thank you so much for the recipes! While I really prefer loose teas over bagged I have been looking for tea recipes. Love this tea and can't wait to see the movie! I never thought of using tea in a recipe. Thanks for sharing! Didn't know there were so many things you could do with tea :). Must try this brand of tea, yummy. I had never thought of cooking with tea :) I will have to try these and look for some other recipes. Wow, that is so creative! I had no idea you could cook with tea! I love the variety fruit flavors of herbal tea from Bigalow, I may have to try to get creative with it too!! I never thought of cooking with tea. I drink tea all the time, but to cook with it is different. Great recipe, I am now hungry. Bigelow makes great teas. I have so many flavors in my pantry. I never thought to do this. I use only no sodium spices for my food so this is something I'm going to try. I actually have some Bigelow in the pantry. Thanks! 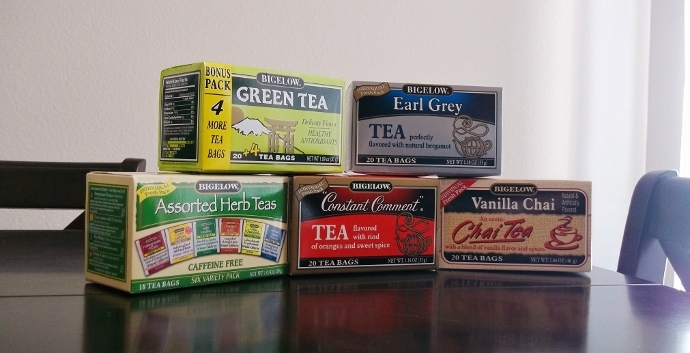 I especially love the fruity or vanilla chai flavors of Bigelow Tea. It helps during my weight loss efforts too bc it helps my sweet tooth and the warm drink helps appease my hunger. I enjoyed your recipes i have not tried cooking with te just like a warm cup tea and love ice tea, but i do believe I am going to try the chicken ricipe.. Pick up your up and have a sip.. I love baking with tea. I've never cooked with tea, just drink a lot of it. Thanks for the recipes. Such a neat idea to cook with tea! I didn't even know they made eggnog tea. I am going to have to try it! My daughter loves tea and I usually buy her a couple of boxes of Bigelow in various flavors for her Stocking. Love this stuff! My sister and I love tea, we drink it in the morning and late evening. I never before thought about cooking with tea, that's a really good idea that I should try out and I'm going to try out Bigelow tea, don't think I've every had it! I am not a big tea drinker but theirs is the best and that recipe sounds AWESOME! I love tea! Thank you for the recipe, looks delicious! The chicken looks awesome, and i loved the movie!! I'm not a fan of iced tea, but love hot tea, especially this time of year! I always have half a dozen different flavors in my pantry, but I've never thought about using it in my cooking...until now. Thanks for the recipes! You are an amazing writer and did complete justice to this brand. I love tea but it is not always good for those with reflux...often a trigger. I do still "steep when i cant sleep" and my teen daughter is close on my heels to the cabinet that holds the tea. I have never in my life cooked with it but I sure will try NOW. The recipe looked so inviting. Thanks for the review of this and the movie! This is pretty crafty. Very Martha Stewart. I would never thought to season recipes with tea. Healthy, really good for you, plus new flavors to experiment with. How neat. My mom loves tea, all kinds including bigelow so it would be neat to use her as my recipe guinea pig lol. Great article! I love Bigelow Tea. I didn't know they are a family run company. That is nice to find now a days. My favorite is the Lemon Tea. There is nothing better when you are sick with a soar throat. their lemon lift sounds really nice and soothing...we are sick with colds so it would hit the spot! I haven't tried cooking with tea. Your recipe sounds great. I loved the Life of Pi book. I can't wait to rent the movie. I may sit down to watch it with a nice cup of Bigelow tea. I've never cooked with tea before, but I definitely have some new ideas now. I would have never thought to make cookies out of tea. That sounds delicious! The Constant Comment Braised Chicken recipe sounds wonderful. Great recipe ideas!! I love the bigelow teas chai and buy it all the time! When I buy tea, it seems I always buy Bigelow. 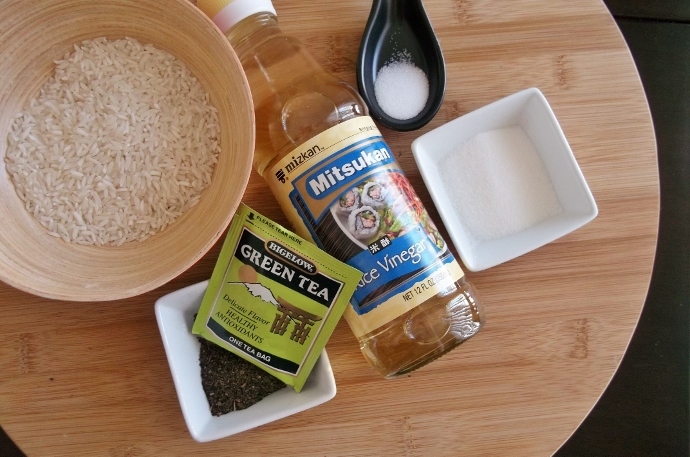 The green tea rice sounds yummy. I love Bigelow tea. There is nothing like a hot cup of tea on a cold winter day! What a great idea! I've never used tea in my recipes! I could never drink my tea with sugar. What a good idea to use tea in a recipe! I've never thought of that. I do love Chai Tea's flavors but I'm not sure how I'd use it in a recipe. I just finished reading The Life of Pi and thought it was an excellent book. I can't wait to see the movie. I really never thought about cooking with tea. Now, I want to try that chicken recipe! I usually only drink tea when I have a sore throat, because I am not much of a hot beverage drinker. When I do have tea, though, it has to be excellent. I like Bigelow teas - especially some of the herbal varities, but also the green tea. I have done very little cooking with tea, but I shall try it soon. Not a big tea drinker, but when I do, I love Bigelow Tea! It is yummy!!! Their Earl Grey might be my favorite. I have just started cooking with tea ( this week in fact! ), and am always looking for new recipes, so I will be trying out some of these! I would have never thought to cook/bake with tea. But of course! Thank you for the recipes & great ideas. Cooking with tea - don't know why I haven't heard of this before. Thanks for sharing. I grew up loving Constant Comment tea. Your chicken looks phenomenal! I've pinned it and plan on trying it soon. Sounds like a wonderful night too. Didn't realize you could do all that with tea. The chicken and cookies look so good! I will have to get the ingredients and try this on hubby! I bet he will be impressed! Great photos. I drink tea daily. Many of my teas are Bigelow too. I like their Earl Grey and Mint Tea best. These recipes look good and interesting. Thanks!